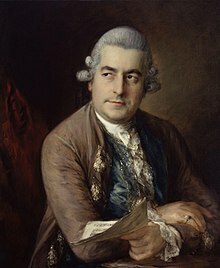 Johann Christian Bach (September 5, 1735 – January 1, 1782) was a composer of the Classical era, the eleventh and youngest son of Johann Sebastian Bach. He is sometimes referred to as 'the London Bach' or 'the English Bach', due to his time spent living in the British capital. He is noted for influencing the concerto style of Mozart. Bach lived in Italy for many years starting in 1756, studying with Padre Martini in Bologna. He became organist at the Milan cathedral in 1760. During his time in Italy, he converted from Lutheranism to Catholicism. In 1762, Bach travelled to London to première three operas at the King's Theatre, including Orione on 19 February 1763. That established his reputation in England, and he became music master to Queen Charlotte. He met soprano Cecilia Grassi in 1766 and married her shortly thereafter. She was his junior by eleven years. They had no children. By comparison, the composer sometimes called "the Father of the Symphony," Joseph Haydn, wrote 104 symphonies. Most of these are not fully comparable to Johann Christian Bach's symphonies, because many of Johann Christian's works in this category are closer to the Italian sinfonia than to the late classical symphony in its most fully developed state as found in the later works in this category by Haydn and Mozart. Using comparative duration as a rough means of comparison, consider that a standard recording of one of Bach's finest symphonies, Op. 6 No. 6 in G minor, has a total time of 13 minutes and 7 seconds (as performed by Hanover Band directed by Anthony Halstead), while Haydn's "Surprise" Symphony in a typical recording (by Ádám Fischer conducting the Austro-Hungarian Haydn Orchestra) lasts 23 minutes and 43 seconds. A full account of J. C. Bach’s career is given in the fourth volume of Charles Burney's History of Music. There are two others named Johann Christian Bach in the Bach family tree, but neither was a composer. Mozart esteemed J.C. Bach's music highly and arranged three sonatas from the latter's Op. 5 into keyboard concertos. Heinz Gärtner (trans. by Reinhard Pauly). John Christian Bach: Mozart's Friend and Mentor. (Portland, Ore.: Amadeus Press, 1994). Percy M. Young. The Bachs: 1500-1850 (London: J.M. Dent & Sons, Ltd., 1970). This article is licensed under the GNU Free Documentation License. It uses material from the Wikipedia article "Johan Christian Bach. Allthough most Wikipedia articles provide accurate information accuracy can not be guaranteed.